* Humanity stands to be profoundly affected by science and technology in the future. We assert the desire ability of transcending human limitations by overcoming aging, enhancing cognition, abolishing involuntary suffering, and expanding beyond Earth. We intend to become more than Human. * The single defining factor of Transhumanism that separates it from all previous philosophies is the proposed use of technology to transcend what it means to be Human. * However this needs to be constrained by some basic ethical principles, not least for our own benefit and indeed survival. We advocate the well-being of all sentience, including humans, non-human animals, and any future artificial intellects, modified life forms, or other intelligences to which technological and scientific advance may give rise. This is to be seen as a consequence of the adoption of Abolitionism, defined by philosopher David Pearce, as our core ethic. * We favour allowing individuals wide personal choice over how they enable their lives, live their lives and if necesary end their lives. This includes use of techniques that may be developed to enhance intellect, mood, concentration, memory; anti-ageing therapies; reproductive choices and technologies that seek to alter genotype and phenotype. We also seek to develop artificial intelligences by various methods. * We recognize that humanity faces serious risks, especially from the misuse of new technologies. However, whilst these dangers need to be explored and guarded against the spirit must be one that embraces the Proactionary Principle rather than the Precautionary Principle. We must not allow timidity to rob us of our unique future. * Positive Transhumanist ideas and ideals need to be infused into public life at all levels, from popular culture and art, to politics and religion. Technologies that facilitate Transhumanist goals need to be adequately funded. The political leadership of our societies need to ensure the benefits are made available to all citizens in a non coercive manner. Attended Nottingham University and later what is now Westminster University, and has a BSc in Physics. Subsequently pursued a career in electronics and computer research and is a research engineer at Surface Measurement Systems. A founder member of Zero State (ZS) and a member of the Futurists Board of the Lifeboat Foundation. 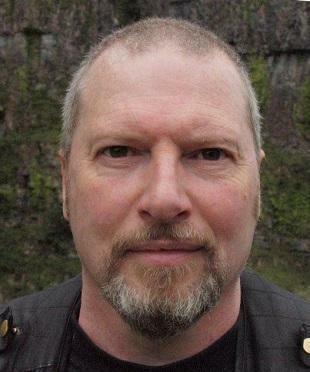 Founder of The Consensus in 2002CE, a political party with a core philosophy of Transhumanism, which has been influential in Zero State and the Wave. Other interests include the interface between technology and theology explored in the books TechnoMage and The Praxis, and was co-presenter of a UK radio show, OneTribe. Head of The Praxis, a ZS spiritual organization. For several years held the position of Branch Master in the World Shorinji Kempo Organization, teaching Zen and martial arts, although is now retired from a teaching role. See Zero State, at: http://wavism.net/group2/.